Interesantes diseños para hacer ropa casual, con emblemas con números que recuerdan al estilo universitario, con un toque grunge que da una imagen muy actual. Disponible en formato AI (Adobe illustrator), CDR (Corel) y EPS. 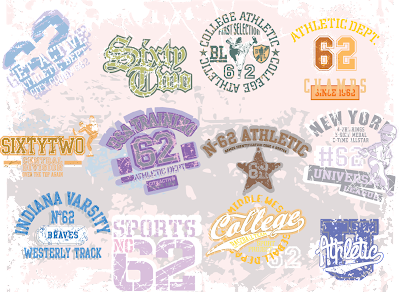 Interesting designs for casual clothing, with emblems, numbers reminiscent of a university-style, with a touch of grunge, which gives a current picture. Available in AI (Adobe Illustrator), CDR (Corel) and EPS.